Finding a pair of boxing gloves that offer sufficient support and protection is incredibly important for any experience level boxer. This is made even harder for women, as the market place is more than flooded with boxing gloves designed solely for men. Having said that, brands are continuing to release more designs specifically tailored for ladies. With this in mind, we’re going to be taking a look at some of the best boxing gloves for women that are currently available. We’ll be reviewing some options at a variety of price points, that are designed for different aspects of boxing. We've also got an-depth buyers guide for you guys to check out at the end of the article. This should hopefully show you what to look out for in boxing gloves, and how to determine which pair are right for you. Check out our comparison table below to compare pricing against our rating. Right, lets' get to the reviews. Cleto Reyes are one of the oldest boxing brands in the world and have garnered a reputation for producing the highest quality gloves that money can buy. 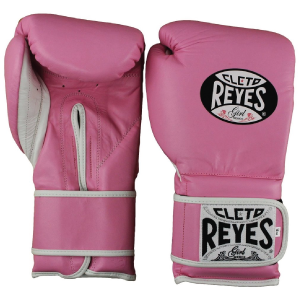 As with the vast majority of Cleto Reyes gear, their training gloves are hand made using genuine goatskin leather. This is great for anyone looking for a pair that they can use for the foreseeable future, as genuine leather is known to be by far the most durable. Not only is genuine leather able to hold up under constant use, it also requires far less of a break in period. This means that they will be feeling comfortable after no time at all, unlike some of the cheaper gloves that can feel like bricks strapped to your hands for a month or two. I’ve also found genuine leather to be more ventilating than synthetic leather. This helps to keep my hands cooler when training, which in turn stops sweat from building up inside and causing them to stink. The inside of the Reyes feature a nylon water repellent lining. This is particularly ideal as it stops sweat from being absorbed into the padding and the inside of the glove, which can cause odour to build up. If you’ve owned a pair of boxing gloves before, you’ll be familiar with the smell. Fortunately, it’s clear that Cleto Reyes have taken extra measures to reduce how much their gloves will smell over time. In terms of design, the Reyes gloves feature a wrap around wrist strap. While boxing purists will swear by lace up gloves, I’ve found these massively unpractical for training purposes. Say for example you partner up with someone for a mitt work out, unlacing and lacing the gloves backup to hold the mitts for them is pretty annoying and time consuming. The wrap around wrist straps allow for them to be taken off and on again very quickly and also keep the gloves fitting securely to your hand and wrist. The cuff itself is longer than what you may be used to seeing. This is done in order to provide your wrist with extra support, allowing you to throw punches harder, with minimal chance of your wrist buckling. Despite costing a fair chunk of change, these really are the best women’s boxing gloves for training. They’re bound to last a long time, are incredibly comfortable and definitely look the part. If you want some more information on these gloves, then head over to our in-depth Cleto Reyes Training Gloves review. 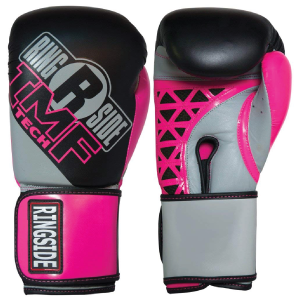 Up next we’ve got the Women’s Training Gloves by Ringside. These come in two color variations - pink & black and white & blue, giving your the option to match them to the rest of your gear. Similarly, they come in two different sizes - 10oz and 12oz. Which weight is right for you is really down to personal preference and how light you are. If you’re fairly lightweight, with lower punching power than the 10oz gloves should be fine. Ventilating mesh is featured in the palm area of the gloves to keep your hands cool whilst training. As I mentioned earlier, this helps to reduce odour building up, which is always a good thing. Ringside have also made use of a leather/ vinyl combo shell. This shell helps to increase the durability of the gloves as it’ll take much more abuse for them to start showing cracks. They’ve also made use of extra vinyl material to web the palm area of the gloves. This provides extra stability and cushioning to the hand area, making them an excellent choice for bag work. While there’s no denying that these are very durable, I’ve heard people mention that they struggle to hold up over a long period of time, especially if you’re training 5 or 6 times a week. Understandably, most people won’t be training this regularly so it won’t matter. However, if you are training on such a frequent basis, it’s something to bear in mind. That being said, most gloves you’ll come across are going to wear out from so much use, so it’s definitely not a deal breaker. Ringside have priced these somewhere in the middle of the boxing glove price spectrum. They’re not exactly cheap, nor are they overly expensive. This makes them ideal for beginners and experienced boxers alike who are looking for a reliable pair of gloves that won’t break the bank. All in all, these are easily one of the best ladies boxing gloves around and are well worth considering. 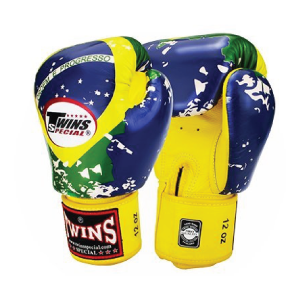 Twins are a well known brand in the Muay Thai game, however are also an incredibly popular choice amongst boxers. 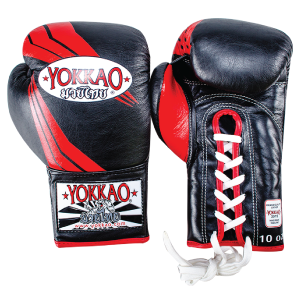 Their products are hand-made in Thailand, home of Muay Thai and where some of the highest quality gear comes from. As such, they’ve attained a reputation for delivering long lasting gloves that are highly protective and made to the highest possible standard. What’s more, these are probably the coolest looking gloves I’ve ever seen. If you like a bit of flare to your gear, then I think you’ve found the gloves for you. They come in a range of different designs, from a gold dragon to the flag of Brazil. Don’t worry, these aren’t a superficial pair of gloves that are more style and substance. They’ve got the quality to back-up their bold designs. They’re made using genuine leather materials, which as I’ve mentioned already, is incredibly durable and long lasting. They also feature a Velcro hook and loop closure system that allows them to fit securely to you hand with no slippage. I have heard these have a bit of a break in period, however that’s completely normal and to be expected with any pair of new boxing gloves. Due to their high quality build and funky design, these are fairly expensive. As such, they’re probably more ideal to boxing enthusiasts who are confident that the money will be put to good use. 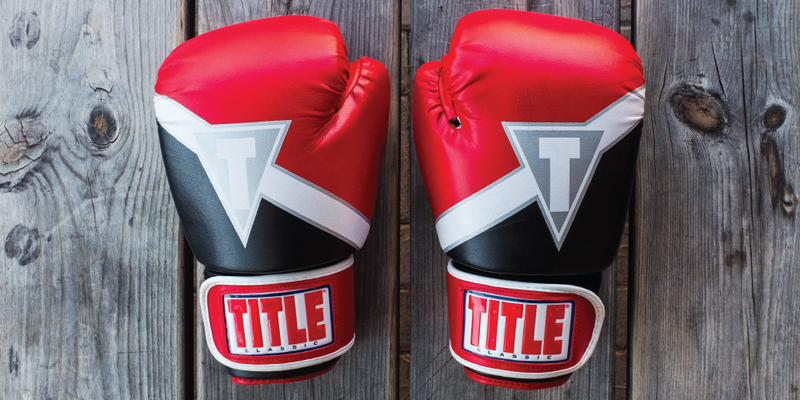 Next up we’ve got the TITLE Pro Style Boxing Gloves, an incredibly affordable, yet high quality pair from one of the world's most renowned brands. These are some of the best value for money boxing gloves currently going. It still surprises me how cheap you can get these for, considering they’re made using genuine full-grain leather. Usually, genuine leather gloves cost a fair bit, but that’s not the case here. The padding around the glove is constructed using multiple layers of both high and low density foam. This produces a highly shock absorbing outer layer that allows for high impact shots to be thrown safely. Inside of the gloves is lined with satin nylon that possesses moisture wicking properties. This helps to prevent sweat from being absorbed into the padding, which in turn causes the gloves to start smelling. In terms of weight, TITLE offer these ranging from 10oz-16oz. If you intend on sparring, the 16oz will be your best bet. If you’re not planning on sparring, then 14oz or 12oz would be perfect for regular training sessions. This weight will allow you to work the heavy bag and throw in some pad work, whilst not overly weighing your hands down. You also have the choice of black, purple and red. I personally love the black option, however everyone’s got their own preference. The Everlast Women’s training gloves are perfect entry level gloves perfect for beginners, or for attending boxing fitness classes. As such, the Everlast's sport an extremely reasonable price tag, ideal for anyone looking to get their first pair on a budget. Everlast have used premium synthetic leather to construct that gloves, that although isn’t as durable as genuine leather, holds up pretty well and is significantly cheaper. What I love most about these gloves in the palm design. While it’s very common to have a mesh palm, the Everlast gloves take this to a whole new level. The vast majority of the palm area makes use of ventilation mesh. As such, they are brilliant at keeping your hands cool whilst training. The hook and loop closure system also features a nifty little upgrade. The strap is elasticated, meaning that the tightness can be adjusted to comfortably fit any shape or size wrist. It’s clear Everlast have made a conscious effort to deliver extremely comfortable gloves. This can also be seen in the shape of the gloves themselves, which have been anatomically design to match the contours of a hand. This provides your hand with a well fitting glove, as it perfectly slots around the natural curvature of your hand. 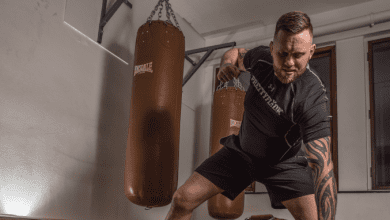 Considering the variety of weights you have to choose from, these gloves can be suited to any elements of training, from heavy bag workouts, to pad work and even for sparring (if you go for the most padded option). You’ve also got the choice of a few different colours, which is great if you’re like me and like you gear to maintain a similar aesthetic (I’m a sucker for black and red). All in all, a great set of beginner gloves that feel as good as they look. If you’re unsure as to what size is best for you, check out the size chart below. 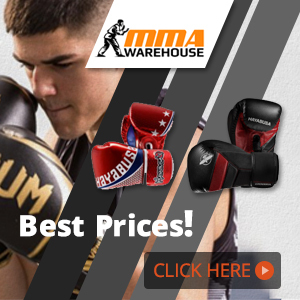 These are another pair of excellent entry level boxing gloves that won’t break the bank. 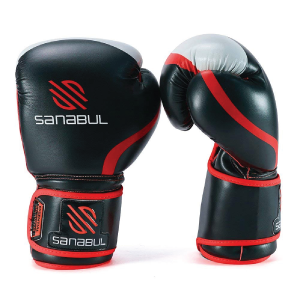 Sanabul are known to produce incredibly affordable fight gear, tailored towards beginners looking for budget friendly, durable equipment. Their gloves are the perfect example of this. Although not as durable as genuine leather, they’re still constructed to a high standard, using premium synthetic leather that’s sure to hold up in any beginners class. This engineered leather is also much easier to clean and maintain, which is always a plus. Sanabul have implemented an arched design into their gloves that matches the curvature of a hand. This is great because it ensures that they fit correctly and won’t slip when your hands begin to get hot and sweaty. They're are also incredibly versatile thanks to the use of gel infused foam. This foam is extremely shock absorbing, making them great for all round training and bag work. Again, this is ideal for beginners looking to buy one pair of gloves that can tick off all the boxes. A mesh palm is also used to provide your hands with sufficient breathability whilst training. This both helps to prevent the gloves from slipping and helps to keep them smelling fresh for longer. 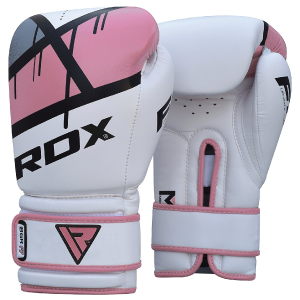 Designed specifically for women, the RDX boxing gloves are brilliant for anyone shopping on a budget and are looking for a durable pair of gloves. They are constructed with a synthetic leather called Maya-hide. This is a man made type of leather developed to mimic genuine leather in terms of durability, look and feel. While not quite as durable as genuine leather, this is about as close as you can get. This in turn allows RDX to offer these gloves for an extremely reasonable price tag, whilst not sacrificing quality. RDX really have spared no expense in terms of offering the highest amount of protection possible. They’ve implemented extra-thick foam padding, designed to protect your hands and dissipate shock equally throughout your hands and wrist. This in turn leaves no specific part of your hand under excess pressure, which is what can cause an injury. When I’m looking for a new pair of training gloves, I always look to find a pair that are easy to take on and off. RDX really fit the bill here as they’ve made use of a hook and loop closure system that can be open and closed easily during training. Also, you may have noticed that the cuffs are also a bit elongated. This is done in order to provide your wrist with extra support, again massively reducing the chance of injury. One area of the gloves that I would have liked to have seen slightly different is the palm area. While it does feature ventilation, it’s nowhere near to the extent that some of the other options on our list offer. This is by no means a deal breaker, just something worth mentioning. The inside of the gloves are lined with moisture wicking material, so sweat doesn’t absorb into the padding. You just may notice your hands get fairly hot when you’re training. 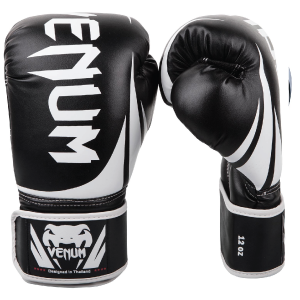 The last pair on our list is the Venum Challenger 2.0 boxing gloves. First off, if you’re a pro boxer or training more than 3 times a week, these probably aren’t for you. They’re designed to be a cheap, beginner friendly pair of gloves suitable for training once or twice a week. This is due to the fact they make use of PU, engineered leather, which is by no means as durable as genuine leather. As such, if you’re working the heavy bag for hours a day, multiple days a week, they’re going to show signs of use. However, if you’re just starting out in boxing, or attend the extremely popular ‘boxercise classes’, then these could well be for you. They’re insanely cheap, come in over 18 different colours and feature high shock absorbing triple density foam. Essentially, everything you need from a basic pair of boxing gloves. What’s more, they range from 8oz-16oz in weight. This is a fairly large scale, one in which allows almost anyone to get a pair of Venum Challenger gloves. If you’re on the hunt for a pair of affordable gloves to use once or twice a week, these truly are a brilliant option. 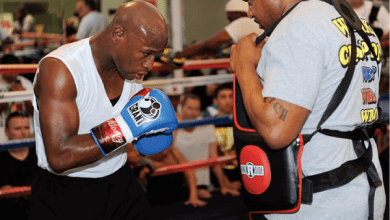 When looking to purchase a new pair of boxing gloves, there are a few different aspects that need to be taken into consideration. This is especially true if you’re new to boxing and aren’t sure what to be keeping an eye out for. If reading isn’t your thing, check out the video below on how to find the best boxing gloves for girls. First things first is the size. Typically, gloves range from small, medium and large. The specific sizing will vary form brand to brand, so be aware that a small in one brand, may be a different size in another. As such, shop with caution and be sure to read customer reviews. Here you’ll be able to see if anyone has mentioned the size and whether or not they fit as expected. If your gloves are slightly on the larger side of things, don’t worry. 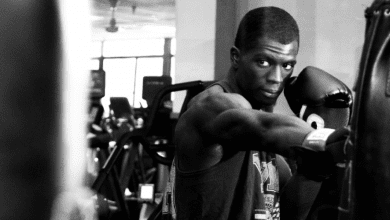 The chances are you’ll be wearing hand wraps a lot of the time, so that will help to improve their fit. As you probably know, boxing gloves come in a variety of different weights, ranging from 6oz all the way to 18oz. Each weight will be ideal for different aspects of boxing, for example heavier, padded gloves would be suited for heavy bag workouts. Below is a table of the different weights you can expect to see and what each weight is ideal for. *These weights and usage will vary depending on your size, and the intensity in which you train. Use this table as a guide, as each person will have preference as to which weight is best for them. When shopping for a new pair of boxing gloves, you’ll need to decide which end of the spectrum you want to go for. Lighter pairs provide less padding and are suited for pad work, where your hands need to be fast. Middle of the range gloves, i.e. 12oz and 14oz are designed for all round usage. These are the best boxing gloves for women looking to buy their first pair, as they’re by far the most versatile. Heavier gloves offer much more padding to the wearer and can be used to help improve arm and shoulder endurance. Similarly, regularly wearing a heavy pair to training can help to increase your hand speed when you go back to using lighter gloves. The material used to construct the gloves is going to have a direct correlation with both their price and durability. Boxing gloves made using genuine materials tend to last the longest due to their high levels of durability, however they are also the most expensive. Considering that boxing gloves are made up of a number of different materials, it’s important to know what you should be looking out for in each part of the glove. I’ll quickly go over the different types of materials used to make boxing gloves and which ones are the most durable. Any boxing purist will tell you the only way to go is leather. This is because genuine leather is by far the most durable. Genuine leather also tends to ‘break in’ a lot quicker, allowing you to get into the full flow of training sooner. Authentic leather is typically more breathable, meaning that your hands get less hot whilst wearing them. This helps to prevent the build up of sweat in your gloves, which as you probably know, can cause them to stink…. Really stink. Over the last few years, we’ve seen the boxing market flooded with synthetic leather designs. A lot of new brands will offer ‘knock-off’ synthetic boxing gloves for really cheap, solely relying on brash designs to sell their goods. This has caused synthetic leather gloves to get a bad, and in my opinion an undeserved poor reputation. That being said, a lot of the top brands now produce synthetic leather gloves, which is a clear sign that they can work. Synthetic leather is completely man made and is designed to resemble genuine leather, both in terms of looks and durability. While it may not be quite as durable, it is much, much cheaper and can still hold up relatively well. 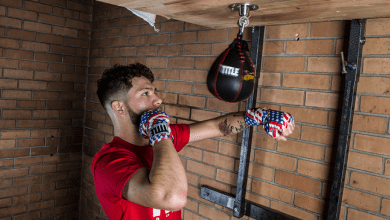 Synthetic leather has also seen an increase in popularity due to more boxers possessing an eco-conscious mind set and are looking to find vegan-friendly gloves. The type of mesh used in the palm area will effect how hot your hands will get whilst training. There are two types of mesh typically used – venting mesh and moisture wicking mesh. Whereas moisture wicking mesh is designed to not absorb the sweat released from your hands. Again, the aim here is to prevent the sweat from lingering in your gloves and causing them to smell. In terms of which type of mesh is the best, it’s really down to personal preference. I personally like moisture wicking mesh, as I find that even with ventilating mesh, my hands will still get hot and sweat. The quality of boxing gloves' padding with determine the protection that they have to offer. Similarly, the more padding a glove possesses, the more they're going to weigh. Typically, multi-layered foam padding is the most common type used. The use of multiple layers allows the gloves to absorb a high amount of impact, and therefore cushion the blow for your hands and wrists. This multi-layered foam also helps to dissipate the trauma from a blow equally across your hand and wrist. This helps to prevent one part of your hand from receiving the brunt of the force, and therefore decreases the chance of sustaining an injury. 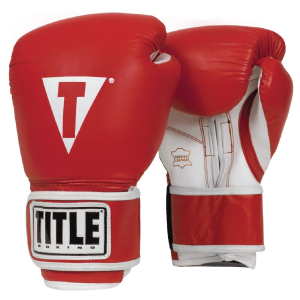 The type of closure system that a pair of boxing gloves use is incredibly important. The wrist straps not only secure them to your hand, they also provide your wrist with support so that they do not buckle when your land a punch. Hook & Loop System: A hook and loop system often makes use of Velcro to fasten the gloves to the hand. These are ideal for training situations where you’re going to be taking the them on and off on a regular basis. That being said, they probably offer the least amount of stability, and come sometimes slide around if your hands and arms start to sweat. Lace Up: This is the traditional type of closure system that's been used for years and years. Laced gloves provide the most stability and are therefore used in competitive boxing. These are fairly hard to get on and off, especially once you’ve got a glove on the other hand. As such, these are less than ideal for training where you may be taking your gloves off on a regular basis (to help with pad work etc...). If you come across a pair with an open thumb design, these probably aren’t designed for boxing. Boxing gloves should have a closed thumb compartment. Q.) Do I Need to Wear Hand Wraps Underneath? It depends on the type of training you’re going to be doing. If it's high impact training such as heavy bag work, then yes. If it’s something laid back like working the speed bag or focus mitt drills, then you probably don’t have to wear hand wraps. Also, if you’re gloves are feeling a bit too large, using hand wraps are a good way to make the gloves fit a little better. If in doubt, just wear hand wraps. They can be annoying to put on, but it’s always best to play it safe and having that extra protection is certainly not a bad thing. Q.) What Size & Weight Should I Get? If this is your first pair of gloves, look for a good all-round pair such as 12 or 14oz. Think about the type of training you’re going to be doing. If it’s primary a fitness work out, then going for a lighter pair of gloves is going to be fine. Whereas if you’re going full throttle in an intense boxing class, gloves that can provide a lot of support and protection are going to be better suited. Often, the weight of the person weighing the gloves can provide some sort of idea as to what weight gloves you should buy. Check out the table below for a rough guide as to what size gloves you should go for. Q.) When do I need to Wear Gloves? Pretty much all the time unless you’re shadow boxing or doing a speed bag work out. Q.) How Are They Supposed to Fit? They should feel close to your hand, with minimal amount of slipping. However, you don’t want the wrist strap to be too tight, as this can hinder wrist dexterity. Q.) Should I Buy More Than One Pair? This depends on how regularly you’re training and the type of training you’re going to be doing. If you’re training once a week, then one pair will be fine. Most people also have a separate pair of sparring gloves that are typically their most well padded pair. Q.) How Do I Stop Them From Smelling? Oh, the age old question. At the end of the day, you’re gloves are going to smell, that’s just a fact. I recommend taking them out of your gym bag as soon as you get home. You can also get deodorisers that help to mask the smell of sweat that can start to build up in your gloves. 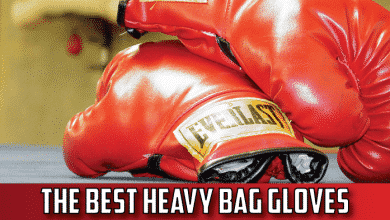 Below are some of the most popular brands of boxing gloves. Cleto Reyes are known to be one of the best, if not the best producer of boxing equipment in the world. Their gloves have been used in the vast majority of World Championship bouts, which just goes to show their level of quality. Their gear tend to be hand-made using only genuine leather material, which results in durability unmatched by most other brands in the industry. 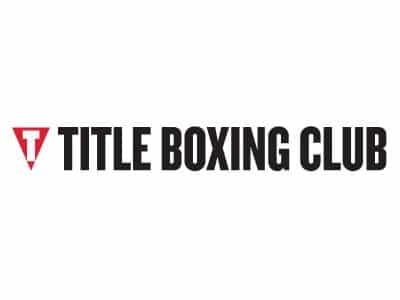 TITLE have been creating some of the top boxing gloves in the world since 1998 and offer a wide variety of different boxing equipment. They’ve recently taken the plunge into the MMA game, where they’re making waves with the same top notch quality seen in their boxing gear. Twins produce a wide range of different martial arts gear and equipment, with a primary focus on Muay Thai. That being said, they’ve released some pretty awesome boxing gloves that have quickly become a favourite amongst boxing enthusiasts. 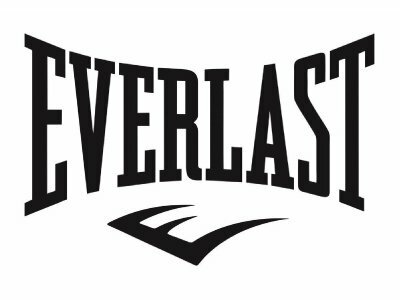 Everlast is the budget friendly brand that everyone knows. Their products aren’t known for being incredibly durable, but they are known to hold up well and not break the bank. While they’re not going to be winning any awards for quality, they’re the perfect brand for beginners looking to get into boxing without spending a ton of money. So, we’ve made it to the end of our article. 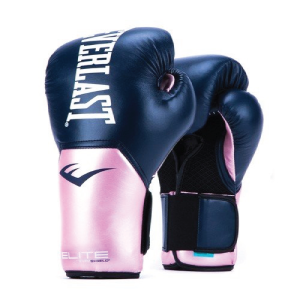 Which pair do we recommend as the best boxing gloves for women? Well it has to be the Cleto Reyes Training Gloves. Although costing a fair bit, their durability and craftsmanship is unmatched by any other pair on the market. They provide a ton of protection, look great and are sure to be used for hours on end of boxing training. Thanks for taking the time to read our list, if you’ve got any questions feel free to get in touch or leave a comment in the section below. Hi there! I'm James, chief editor at MMA Station.com. 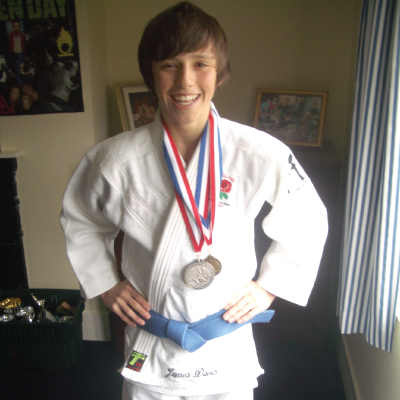 I've been fascinated by martial arts for years and have spent the majority of my life training a number of different disciplines. I and a panel of specialists have made it our mission to bring our followers the best, most accurate information surrounding MMA. Great content, thanks for reviewing these best boxing gloves for women.